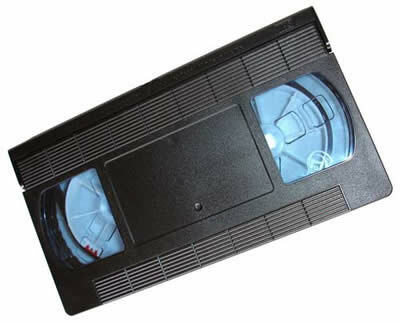 Great VHS Project from BOing BOing! 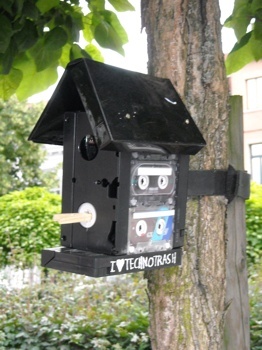 The all-things-creative-tech blog BOing BOing has a wonderful post about using VHS cassettes and DVD cases to make bird houses! You can see it here; VHS Birdhouse. Our friends at the Lower East Side Ecology Center, and the Apple Specialists at Tekserve, are working on another eWaste collection. See this video and their websites for more information! Earth 911 maintains a comprehensive list of recycling centers, as well as instructions about how to make your home, office, and school a greener place. A recent article on the site highlights NYC’s new clothing recycling program. “If you had to identify a city in the U.S. that has its finger on the pulse of what’s fashionable, New York City wouldn’t be a bad choice. Be it the city’s semi-annual Fashion Week or the numerous fashion publications based there, New Yorkers are very much up on what’s hip when it comes to clothing. But this then begs the question – what should the city’s denizens do when their duds are so last year? Well, if the city’s government has anything to say about it, people will be recycling those old clothes. As AP reported (via Yahoo), the city will launch a program in September that will place 50 collection bins across the city in areas with a lot of foot traffic, to entice people to recycle their clothing instead of tossing them. As the article notes, Americans chuck nearly 10 pounds of “socks, jeans, shirts and sheets per year, per person,” according to the Environmental Protection Agency (EPA). In addition, per a survey of 600 adults byGoodwill Industries, “more than half of the people who donate clothing say they wouldn’t go more than 10 minutes out of their way to make a donation,” so clearly convenience is important. It’s uncertain as of now who’ll be responsible for the bins, with the city taking bids from nonprofit companies interested in taking on a 10- to 15-year contract, and Goodwill Industries is one such nonprofit. As Goodwill spokesman Alfred Vanderbilt noted, “There has not been another program like this that we know of. We think they are being very creative and we hope this sets a new standard.” Don’t be surprised if that’s the case and you see more clothing collection bins popping up in other cities in the next few years. 60 VHS Tapes Donated to ACT, Inc. This year we donated 60 in the spring, and many more VHS tapes to the ACT, Inc. organization. You can continue to drop off tapes in September. You are currently browsing the Green Gremlins weblog archives for July 2010.